At SAP Insider in Singapore last year, we had a little fun with rubber ducks that turned into something of a meme for the conference. My keynote included a rubber duck and the social media lounge featured a flotilla of yellow rubber ducks floating in a glass tank. 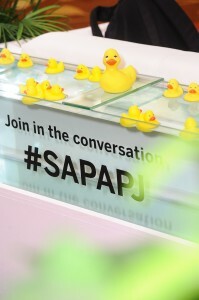 Afterwards, I started to see rubber ducks cropping up at various SAP events all over the world, so at this year’s Singapore Insider event, the ducks were back in full force, prompting a few people around the globe to ask me for an explanation. There’s an expression in English, to “have all your ducks in a row,” meaning to be organized or to have your affairs in order. The ‘duck in the water’ take on that came from a talk by American newscaster and television personality Jane Pauley in which she advised that when tackling a big undertaking, sometimes it’s best not to wait until you have all your ducks in a row. Sometimes, you just need to get a duck in the water. That resonated with me because it speaks to something that’s very real and that I see every day in my work trying to help businesses move forward with a big data strategy: people are so worried about failing that it paralyzes them, and they can’t even get started. My message is always, get started, and I planned to incorporate Jane’s duck analogy into my keynote. The idea to use actual ducks was—excuse the pun–hatched at the last minute. This was the first ever Insider event in APJ, and the first ever social media lounge at an Insider event. We weren’t sure how it would be received, so we wanted to make sure it was engaging and appealing. I’m still not sure where the marketing department managed to get the tank and all those ducks at the 11th hour. But I’m glad they did, because the ducks turned out to be one of the more memorable elements of a memorable event. They were something people could hold in their hands, talk about, tweet about and have fun with. People came by to ask about them, take pictures of them and have their picture taken with them. When the conference ended, everyone wanted to get their hands on a duck—business suited attendees, hotel personnel and construction workers breaking down the lounge. Talk about a swag grab. That evening and for days afterward, the ducks started showing up in photos that made their way across the SAP Twittersphere. They were photographed drinking beer at the local pub, floating in the hotel pool with SAP Mentors and getting Chicken Pox in South Africa. So that’s the story. It all started as a nod to an idea I wanted to get across: getting a duck in the water as a metaphor for getting started with big data analytics. The way analytics are reshaping the competitive landscape today, you can’t afford to be paralyzed with fear. Things are moving so quickly that you can’t wait until the stars and the moon align. You have to get started now, and if you pick the right team, and the right project, everybody will contribute and the group will align, just as baby ducks fall in line behind their mother. 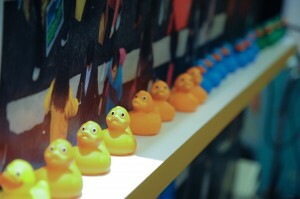 If a few little yellow rubber ducks can make that all seem a little less scary, I’m happy to be associated with them. Homepage » Big Data » What the duck . . . ?